I don't often wake up early in order to beat a rush especially in the back country. 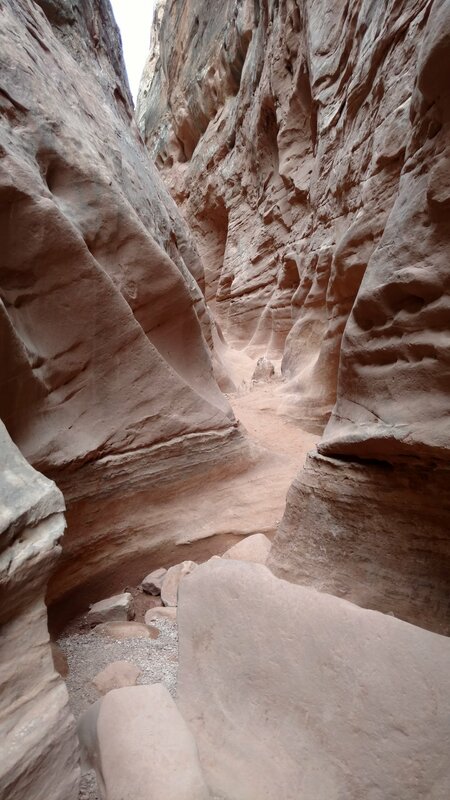 But after reading about Bell & Little Wild Horse Canyon loop in the "Wow Guides - Utah Canyon Country" by Kathy & Craig Copeland I decided it might be worthwhile to arrive early if we wanted to enjoy any solitude in the canyon. The Copeland's trip report starts off with; "On a Saturday in mid-October there were 30 vehicles at the trailhead." I had planned on counting the number of cars when we arrived, but I can thankfully say it was less than 30 by a long shot. The Copeland's weren't wrong, it's just that this was a Sunday and we had been watching a steady stream of vehicles leaving all morning. And it's May not October. Spring is over and the summer temperatures are getting warmer by the day. This weekend has been cool, but within the next couple weeks the temperatures will be triple digits. Having viewed several canyons featured in the Wow Guide this trip, it came as a surprise the warning sign posted at the information board that the loop would take 4 - 6 hours to complete. I was expecting 2 hours. We had snacks for a short hike, but no lunch. Water was on the low side, but probably okay for the day's temperatures and exertion. Our camp was several miles away so we decided to press on even given the light supply of fuel (food). 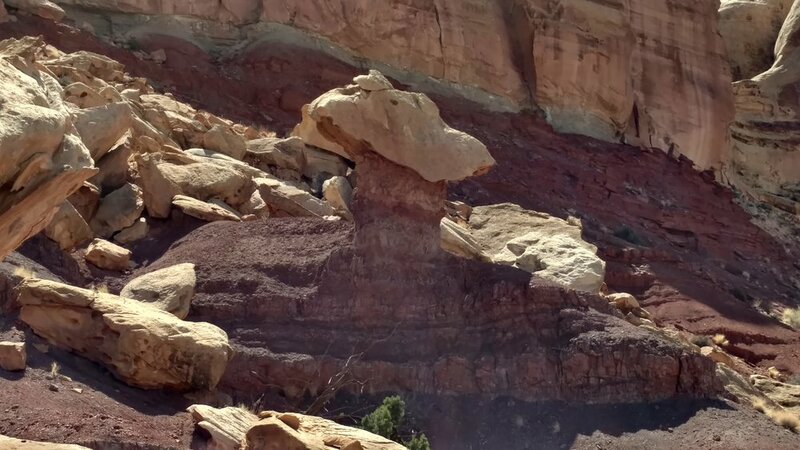 A second warning sign also seemed relevant as the notice was given that this was the most heavily traveled loop in the entire San Rafael Swell. Still we pressed on. Following the guide book we turned left at Bell Canyon. Bell is the shorter of the two canyons, with a walk along a road on the other side of the Swell with a return trip through Little Wild Horse Canyon. We were soon rewarded with the beautiful shade of a slot canyon. Both Bell and Little Wild Horse Canyons are essentially walk through canyons. Some obstacles exist, but none require ropes or gear of any kind. Rocks have often been piled up to allow an easy climb to a higher level if needed. There are obstacles however and anyone with limitations in mobility will be quickly challenged. We travel the length of Bell Canyon without running into another person or group. I am surprised but delighted by the solitude we seem to be enjoying as we move in and out of the narrow canyons. 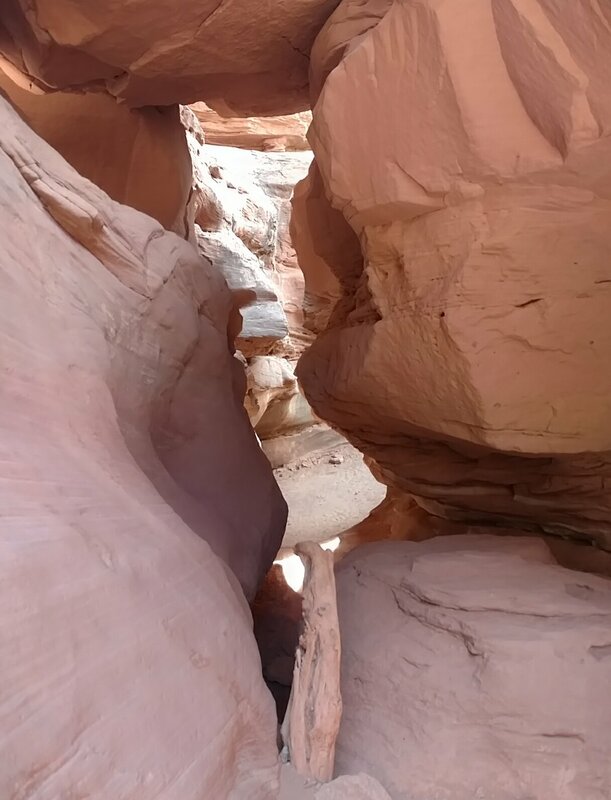 Most slot canyons are not a solid set of high walls, they are more often a series of wide spots followed by narrow gaps. Bell Canyon is this way as we walk from narrow to wide. The shear size of the rock surrounding us is breathtaking as we walk along the rock bed base. We soon reach the road and greet the first two groups of people making their way along the road going in the opposite direction. They had chosen to hike Little Wild Horse Canyon first. The distance is the same obviously, but usually guide writers have a reason when they spell out a specific direction for a loop. As we started up the steep road heading to the next canyon, I begin to wonder if the Copeland's didn't have a bit of twisted humor is recommending Bell Canyon first. As we near the zenith of the road, Linda stops to remove a pebble from her shoe and I notice a rock Toadstool. Toadstool's are common in other areas of Utah, but this is the first I had noticed here in the Swell. Toadstool's are formed when a rock of hard material lands on top of softer dirt. The hard rock protects the soft dirt from rain as over the years the soft dirt is washed away leaving a pinnacle of soft material with a rock topping. We are greeting people on a regular basis now as we walk along the "behind the rim" road toward Little Wild Horse Canyon. The walking has turned easy as we move toward the low point and the wash way creating our next canyon. As soon as I step foot into the soft gravel of the wide wash I understand why the Copeland's recommended the clockwise progress through the canyons. Wild Horse Canyon is the longer of the two canyons and having to walk "uphill" in this fine gravel wash would get old real fast. There is fine gravel in Bell Canyon as well, but it is shortened by reaching the road base and hard packed earth relatively quickly. I'm glad we followed the guides advice. As the canyon starts to constrict and deep rut forms in the wash below. Stepping onto a large bolder we enter the first section of slot canyon. Little Wild Horse Canyon is different that Bell Canyon in that is has a large number of over hanging features as part of the canyon. This occurs when the water which had previously been running on a hard section of stone breaks through to a softer underbelly which washes away quickly. The hard stone is able to support the weight (in most cases) and a beautiful overhanging slap of sandstone is produced. At one particular pinch point we hear voices and wait for a small group to emerge from below through a narrow slide. This would be very difficult to climb up. In waiting and visiting with a member of the group explained. "Nothing harder than downclimbing in canyoneering except going up". And that pretty much sums it up. We climb down the slide and are rewarded with a stunning view of an overhead cavern of rock and sand. As the canyon widens then narrows and passes through different layers and colors of rock we are enthralled by the experience. The canyon continues to narrow and we soon find our way weaving back and forth through a beautiful red rock canyon as wide as our outstretched arms. One section includes harder rocks inlaid within the softer sandstone. The effect looked like Dinosaur bones from a excavation dig. Spectacular canyon. As we walk in awe, we meet fellow travelers in the narrow confines. Finding a hole is about the only way to pass in these narrow alleyways. As we emerge from the tight confines we hike back to the trailhead. There is almost a reverence as we finish this amazing journey. Having completed the entire loop the parking lot is almost empty of cars as those who stopped to "take a look" have moved on to other sources of enjoyment.